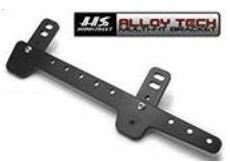 The Hardstreet Alloy Tech MultiFit Brackets set a new standard in strength and adjustability. These new brackets are billet machined 6061 aircraft alloy for strength and light weight. The alloy material resists corrosion and the black anodized finish helps to keep the bracket looking great. These brackets allow for a close fit against the bike but still allowing use of quick release back rests. The unique features of the Alloy Tech are there adjustable Hanging tabs they can be moved and angled. No more will you have to compromise on your pipe setup or your seat setup. These brackets are especially adaptable to older bikes where a lot has been modified or changed. Features: Works with most quick release back rests Includes Spacers,and Mounting HardwareMade in the USA,Note: The Alloy Tech MultiFit Brackets fits: Sixer Bags,Slimbags and HR Slimbags,but turn signal relocation may be required.